MAMA SAMANTHA is super sweet and friendly! MAMA SAMANTHA gets along really well with cats/kittens, dogs and people! She is about 1 year old and had a litter of kittens at a kill shelter - she was just a baby having babies! Sadly, only one survived (BABY SAM - who is also up for adoption.) 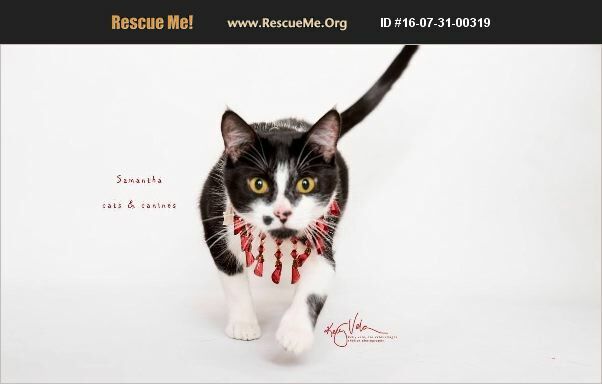 MAMA SAMANTHA was rescued from a high kill shelter in the nick of time with her babies and is at a foster home, but is really hoping a wonderful person chooses him to be part of a loving forever family. MAMA SAMANTHA is housebroken, always uses the litterbox, doesn't spray, doesn't scratch up the furniture, and is well-behaved. As well as current on all shots/vaccinations, is fixed, microchipped and tested negative for FeLV/FIV. Bring some silly love into your home today! Steps to adopt: Please fill out our adoption application here. Make arrangements or show up to one of our adoption events to meet the animal/s you are most interested in. There may be a required home check. There is a required minimum adoption donation; please inquire as to details.